The number of visitor arrivals to Macau during February rose by 15.5 percent year-on-year according to data released on Friday by the city’s Statistics and Census Service. The visitor tally was approximately 3.55 million last month, compared to about 3.07 million in February 2018. The bureau said the increase was because of the Chinese New Year (CNY) festive period, celebrated in early February this year. The holiday is calculated based on a lunar calendar and the dates vary from year to year. Visitor arrivals to Macau during the Chinese New Year holiday period increased by 26.6 percent from a year earlier, passing the one-million mark for the first time. The week-long holiday season is usually a peak time for Macau’s gaming industry as hundreds of thousands of mainland Chinese tourists take advantage of the official break to visit the city. Friday’s release of monthly data also referred to the recently-opened Hong Kong-Zhuhai-Macau Bridge as an element in the year-on-year expansion of visitor numbers for February. 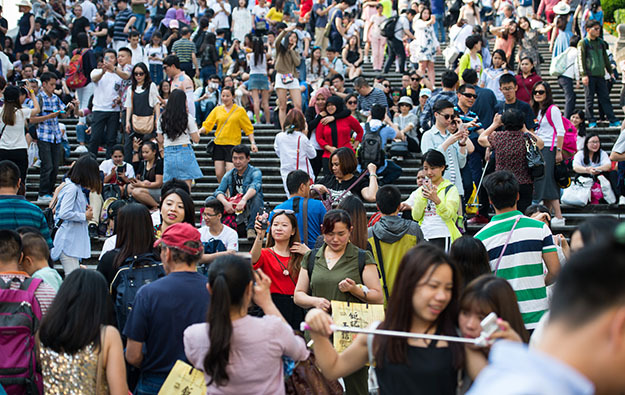 Visitor arrivals by land were up 30.9 percent year-on-year to nearly 2.58 million in February, with nearly 20 percent of them having arrived in Macau via the Hong Kong-Zhuhai-Macao Bridge, showed Friday’s data. In February, the number of same-day visitors grew by 21.5 percent year-on-year to just below 2.04 million, while the number of overnight visitors rose by 8.2 percent to just over 1.51 million. Overnight visitors to Macau are a segment generally regarded as of higher value to the local casino industry than day-trippers. But a number of investment analysts has said that Macau’s headline visitor numbers historically are not directly correlated to overall gaming demand, as gross gaming revenue in the Macau market has been typically skewed to high-end play, and that is more linked to consumer credit availability in key markets such as mainland China. During the February reporting period, the total of visitors from mainland China rose by 11.9 percent year-on-year to nearly 2.56 million. The monthly number of mainlanders travelling under China’s Individual Visit Scheme – accounting for about 1.46 million arrivals last month – increased by 4.2 percent year-on-year. In the first two months of 2019, visitor arrivals stood slightly above 6.97 million, up 19.9 percent from the prior-year period. The head of the Macao Government Tourism Office (MGTO), Maria Helena de Senna Fernandes, said in January that the Macau authorities were forecasting the 2019 visitor tally could be more than 38 million. In 2018, the aggregate number of visitor arrivals exceeded 35.80 million, an increase of 9.8 percent from 2017, according to official data.